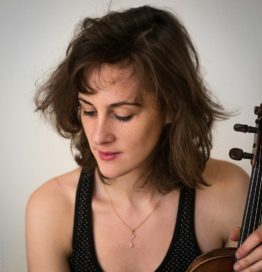 In 2018 we welcome for the second time Fiona Monbet, a gifted and versatile violinist who dances nimbly through a variety of musical genres: classical, jazz, Irish, and gypsy jazz. It is said that she was drawn to the latter by hearing Didier Lockwood in concert. In any case, she proceeded to study with him at his well-known academy in Paris and graduated, so to speak, to joining him on stage on a number of occasions. Here they are cutting loose Django’s Tiger with the Gypsy jazz lion himself, Biréli Lagrène. That is typical of the company she keeps when playing Gypsy jazz. Here she is back in 2009—at all of 20 years old—performing Dark Eyes with Frangy Delporte and Florin Gugulica (and the incontournable William Brunard on bass.) Her solo starts at around the 3:38 mark. When Monbet is not busy playing gigs with Europe’s finest gypsy jazz musicians, she can be found conducting orchestras, recording her original compositions, working on music for the films of Tony Gatliff, acting, and winning chamber music awards for her classical music collaborations.